Between the years 1492 and 1563 when Argula von Grumbach and Elizabeth of Braunschweig were living, the world was in the middle of great changes. It was 1492 when Columbus sailed and discovered the new world. The printing press was later developed by Guttenberg and Martin Luther had made the powerful call for reformation. Onto this stage of history, God placed two very different women in roles that impacted their family and countrymen for the glory of God. Argula von Grumbach was born to a baronial Catholic family in Bavaria near Regensburg in 1492. Her family was very pious, and even though the family was warned by their Franciscan advisors against giving Argula a Bible (because it would “only confuse her”), her parents presented her with a Koberger Bible at age ten. She studied it avidly as it had been written in German. In her later life, Argula became a walking German Bible with much of it committed to memory. By age seventeen, she had lost her parents to the plague and was taken under the wing of Duke William who promised to be like a father to her. When she reached the age of 24, she married Friederich von Grumbach, a nobleman by birth, who had also lost his money during the many wars. However, the Duke gave him a position in the royal court. In 1522, many of the writings of early reformers Martin Luther and Philip Melanchthon had been published in German and Argula absorbed it all becoming a follower of Luther’s teachings. However many of the authorities were trying to squelch the ideas which Luther professed. It was at this time that a controversy arose at the University of Ingolstadt when a young student/teacher named Arsacius Seehofer had put forward the ideas of Luther and Melanchthon. The university and civil authorities warned this young man and then arrested him twice. Following this, they threatened him with death if he did not recant. The young man recanted under great duress, and no one came to his aid until Argula heard of the matter. Argula wrote a letter to the university scholars and civil authorities on September 20, 1523. She objected to the action of the faculty, and plainly laid out her case. This letter became published as a pamphlet, and in less than two months it had been printed fourteen times. She also wrote letters to the Duke of Saxony, Luther’s protector, and to a representative of the Emperor whom she had met at an imperial Parliament meeting. These letters also came into print and were widely read. Up until this time, her aristocratic status had protected her but the authorities were becoming worried over the growth of this protestant movement. The Duke dismissed her husband from his position and turned Argula over to him to discipline as seemed fit. Even violence against her would not be punished. However, her husband, a Catholic, did little but scold her. In addition, a poem, supposedly written by a student at the university, was written about her calling her uneducated among other things. Argula took this, too, in stride and fired back with a poem of her own. Because Argula had dared to challenge the establishment, she was called many things: “a female devil”, “a female desperado” and a “wretched and pathetic daughter of Eve”. Nevertheless, she remained faithful to the call of Christ in her life and did her best to be a good mother and wife. She stood in the gap to help a young student/teacher when no one else had come to his rescue. While Argula’s husband never embraced the faith, he allowed the four children to be raised as protestants. He died in 1530 the same year that Argula had an opportunity to meet Martin Luther in person. She later remarried, but her second husband died within two years. He left her a great estate and she used the money to help others in the faith. What encouragement we should derive from her story. As writers and bloggers, we may not realize how many lives we touch just by the written word presented to God’s great glory. Argula should be remembered as someone who knew that the pen was indeed mightier than the sword. However, she was not alone in using her talents for the Lord. Elizabeth of Braunschweig was powerful as a political influence in the Reformation. She was born in 1510 in Bavaria and married by the age of 15 to man 40 years her senior, Eric of Braunschweig-Calenberg. Together they had four children – three daughters and a son. For ten years, there was no difference in religious beliefs between husband and wife. However, in 1538, her mother Elizabeth of Brandenberg (also a famous woman of the Reformation), brought to her a young man who had come to believe in the evangelical faith. At the request of this fellow, she called for a Lutheran Pastor named Corvinus to come and tell her more about this understanding of Scripture. Elizabeth was so moved that she embraced the faith. Her husband, Duke Eric, did not try to interfere. He was content to remain a Catholic and had no trouble with her embrace of these new ideas so long as she did not try to convert him. Interestingly enough, Duke Eric had been present when Luther gave his defense at Worms, and he was deeply moved. Nevertheless, he was not interested in changing his religion. What he did not realize was that this faith which Elizabeth had embraced would cause her to spread it far and wide throughout the kingdom. This would create problems for him as he could not remain neutral in this struggle between Catholicism and Protestantism. These ideas were inextricably linked with the political powers and struggle between the various German states. Elizabeth had been given two towns for her widow’s dower which were to be her security. She wished to keep these even as she spread the ideas of Luther. She also wanted to keep the kingdom intact for the sake of her son Eric. Her kingdom would be threatened by a nephew of her husband, Heinz “the Wolf” who oversaw another state in Germany. This threat came to pass after her husband died. At the time of her husband’s passing, her son Eric was 12 and could not take the throne until he reached the age of seventeen. During these five years, Elizabeth reigned over the kingdom. She also spent a good deal of time catechizing her children and especially her son Eric by bringing Pastor Corvinus into her household. While she reigned over her state, she married Duke Poppo of Henneberg who was also a Reformed believer. She saw to it that two of her daughters married men who believed the truths of the Reformation as well. However, when it came to her son, Eric, things were different. He took over the rule of the land upon his eighteenth year, and after attending a special meeting for all the Electors in Regensburg, he rejected his reformed beliefs and embraced Catholicism once more. Elizabeth was heartbroken. She feared the influence of others at this meeting, and she was correct. Other reformed family members called Eric a Judas. However, he was determined to return the Catholic faith to the kingdom and he even threatened his wife if she did not recant. She refused and he cast her off. In addition, Pastor Corvinus was put in prison for his faith. Elizabeth wrote a letter rebuking her son for his position and imploring him to release the prisoners he had taken for their faith. However, he responded that while he loved her, she must obey the Holy Roman Emperor or he would have to take action. There were a number of battles fought during this time which culminated in a battle in which Eric lost to Heinz “the Wolf” his cousin. In the agreed upon peace, Elizabeth was sent into exile with her daughter Katherine. She remained there for three years in utter poverty. During this time, she wrote hymns and found comfort in her Lord. Her son Eric never returned to the faith, but went on to serve the Emperor. However, Elizabeth had triumphed in her cause. Eventually all of Braunschweig embraced the Reformation faith as a result of faithful pastors and the fervor of Elizabeth of Braunschweig. One person can make a big difference. Perhaps the greatest lesson we can learn from her life is that our children are not our own. She did her best to raise them to know the truth. A friend of mine reminded me one time that “God has no grandchildren, only children.” We cannot make our children believe. We can only lead them to the truth. The rest is in God’s hands. Both of these women offer to us examples of courage in the face of great opposition. Each of them was gifted, and used their abilities to serve the Lord in faithfulness all of their lives. May we be found faithful as we fulfill our call from the Lord no matter where He has planted us! Soli Deo Gloria! 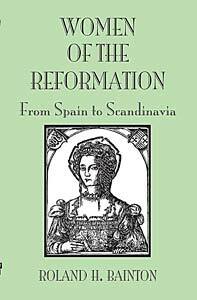 Today we will be giving away 1 copy of Roland Bainton’s “Women of the Reformation: From Spain to Scandinavia”. Please leave a comment to let us know you are interested. International entries are welcome for this contest. 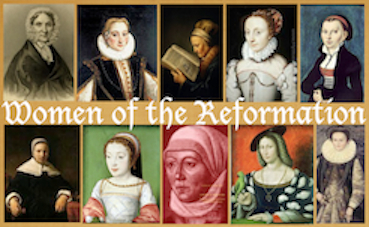 Women of the Reformation Closing & Book Giveaway Contest Winners!